Attendees at the Alabama Solid Waste Study public meeting in Montgomery discuss the state’s landfill permitting process. The Alabama Solid Waste Study being conducted by Auburn University School of Engineering on behalf of the Alabama Department of Environmental Management is in full swing, with public meetings being held all over the state. 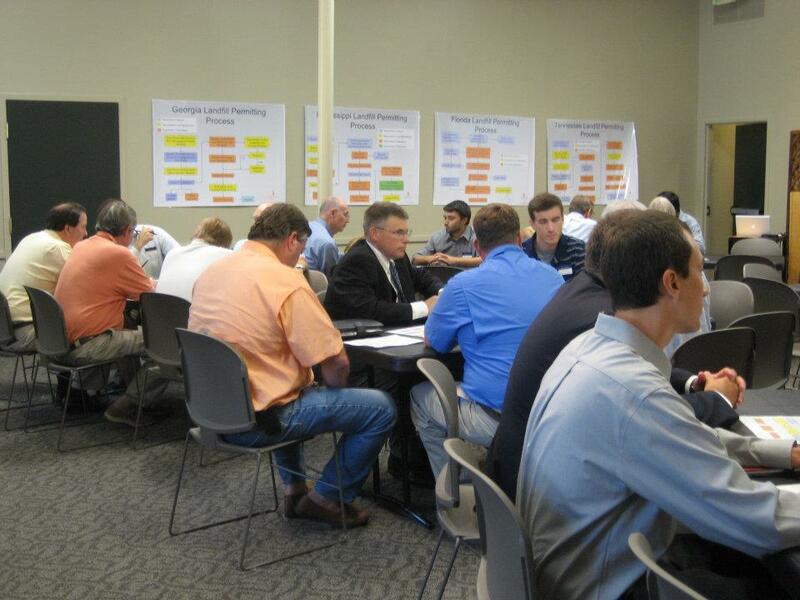 Conservation Alabama attended the first two of the meetings – in Montgomery in June and in Anniston in August. The meeting schedule is shifting into high gear over the next few months, so make sure you check the schedule on study’s website to find a meeting in your community. Unlike traditional public hearings, these meetings are designed in a charrette style, where participants break into small groups to discuss solid waste practices in the state. Participants are able to review the permitting processes for surrounding states and compare them to Alabama and study graphs displaying the locations of municipal and industrial landfills in the state. In addition to discussing the administrative steps involved in the permitting process, the research team is also seeking public input for ways to reduce the amount of solid waste sent to landfills. Rather than viewing waste as simply something we throw away, the team is analyzing ways to view it as a resource. Discussion has centered around increasing recycling efforts to reduce the amount of waste sent to landfills as well as converting the waste to energy. The study stems from Governor Robert Bentley’s 2011 Executive Order declaring a moratorium for new landfill permits. Thanks to a legislative extension of the Executive Order, the moratorium is now set to expire on May 31, 2014, allowing ADEM adequate time to prepare policy and programmatic recommendations for better management of our waste. Alabama has developed a reputation as the nation’s dumping ground due to our current landfill policies that encourage other states to ship their waste to our state. While a reprieve from new solid waste facilities was certainly needed in a state with the capacity to accept 65,000 tons of trash per day while its citizens only produce 14,400 tons daily, other components of the Executive Order are equally important. The Order directed ADEM to study the current landfill permit approval process, research techniques to reduce the amount of waste sent to landfills, and make recommendations to the legislature based on the findings. These meeting allow us to have a voice in updating these policies and ensuring a future where we protect Alabama the beautiful. Be sure to attend one of the remaining meetings in your area, or submit comments online if you cannot attend in person.